The first major Asian show of the new year is on January 11th as Kadoebi put on a very interesting looking show with a main event that has us very excited and a card that is actually pretty interesting through out. The main event will see Yoshitaka Kato defending his OPBF Lightweight title against fast rising youngster Masayoshi Nakatani in a bout that we are really, really looking forward too. 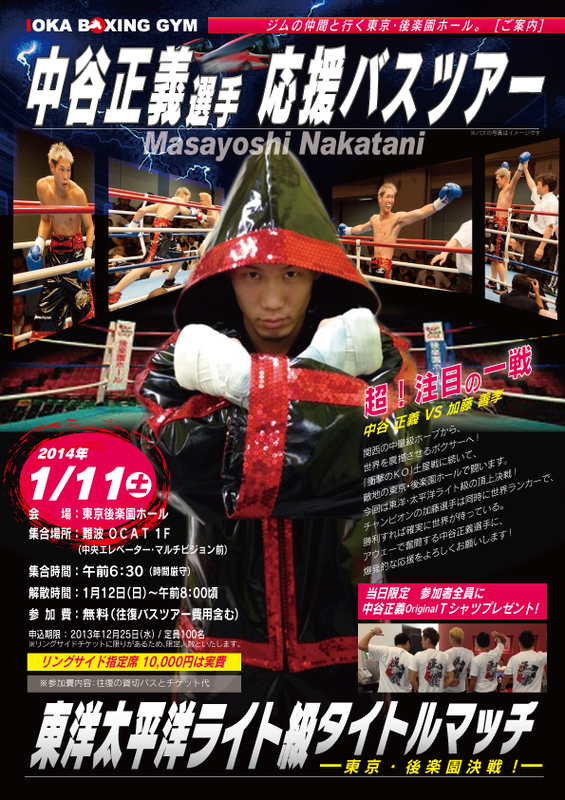 Although Kato will be favoured we are leaning towards Nakatani scoring the upset in the first OPBF title of 2014 and one of the first notable world wide of the new year. As well as the main event the card is also set to feature Yukinori Oguni and Kenji Kubo who are both promising youngsters even though both do currently have a loss on their record. As with most fights now, it seems that we some how get 2 posters with the top one coming from Kadoebi whilst a second one has been put out by Nakatani's promoter Ioka. Of two two it's certainly the Kadoebi one that looks more like a show poster but the Nakatani one is genuine the better looking and more professional one, even if it is just based on Nakatani.